This new series delivers next-generation AIS technology, easy installation and advanced navigation performance to any vessel. 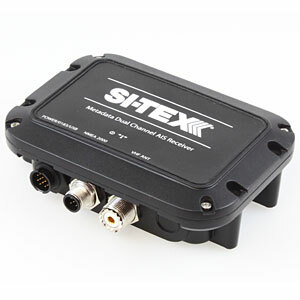 The Metadata family includes a Dual-Channel AIS Receiver, Class B AIS Transceiver (send and receive), and innovative Metadata Zero Loss AIS Antenna Splitter, each housed in a compact, waterproof case for flexible installation. Provides advanced AIS features with plug-and-play performance for chartplotters, radars, onboard PCs and other electronics. A Metadata AIS Module gives your new SI-TEX chartplotter powerful AIS functionalities that greatly enhance safety and enjoyment on the water. Boaters can view AIS targets in different colors based on vessel type, call up an easy-to-use AIS Legend Window for reference, enable safety alarms for Closest Point of Approach and Time to Closest Point of Approach, and filter out unwanted distant targets for a cleaner display. A Report List lets navigators scroll a list of all AIS targets, call up information on any vessel, locate any vessel on the chartplotter display, or select “Go To” for instant navigation to the AIS target. A new Auto Pop Up feature for dangerous AIS targets makes it easy to steer clear of potential hazards. Each module is IPx7 Waterproof, measures just 5.5”X3.9”X1.9"